ITA’s Executive Director for Export Policy, Promotion, and Strategy Michael Masserman participates in round table discussion about U.S. competitiveness in Africa with representatives from the Export-Import Bank, the Overseas Private Investment Corporation, U.S. Trade Development agency and hosted by Congresswoman Karen Bass (D-CA) and moderated by Dr. Sharon Freeman, Chairman and CEO of All American Small Business Exporters Association. President Obama recently said sub-Saharan Africa is poised to be the world’s next greatest economic success story, with U.S. exports to Africa topping $21 billion a year. In fact, Sub-Saharan Africa is home to six of the ten fastest-growing economies in the world, and enormous opportunities exist for U.S. companies to not only do well – but to do good. That’s why then-Acting Commerce Secretary Rebecca Blank launched the Doing Business in Africa Campaign (DBIA) last November in Johannesburg, South Africa. The campaign furthers the President’s vision of more robust commercial engagement in sub-Saharan Africa by helping U.S. businesses benefit from the export and investment opportunities in the region. With the commitment of the Department of Commerce, the International Trade Administration, and interagency partners, DBIA is actively promoting the opportunities available to companies in Africa. 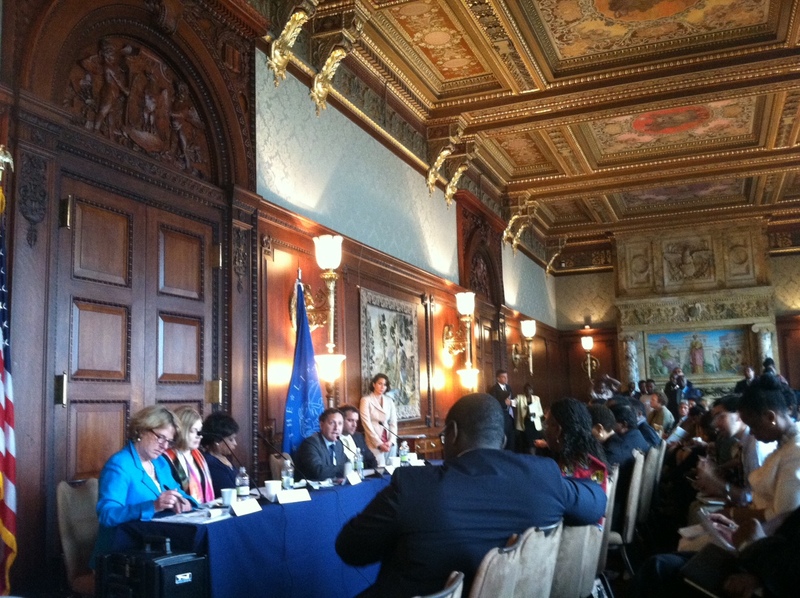 Just this morning Commerce, the Export-Import Bank, the Overseas Private Investment Corporation, and U.S. Trade and Development Agency joined a round table hosted by Congresswoman Karen Bass (D-CA) with more than 100 stakeholders including the diplomatic corps and small businesses to talk about U.S. competitiveness in Africa. Each agency highlighted resources available to companies and how they fit together under the DBIA Campaign. Pittsburgh-based Cardinal Resources, LLC seized the opportunity. Cardinal is an environmental and energy company that produces solar powered water treatment systems. From the company’s beginning in 2004, Cardinal Resources’ founders have always seen exporting and reaching international customers as its key to success. The U.S. Commercial Service (CS) assisted Cardinal Resources, LLC with exporting their solar powered water treatment systems to Africa, including Senegal, Nigeria, Cameroon, Sierra Leone and Ghana. The Commercial Service communicated with customs authorities to help reduce duties and taxes; therefore, Cardinal Resources, LLC was able to more effectively complete the costly procedure of providing demonstrations of their solar powered water treatment systems to potential buyers overseas. The company is happy to report that they successfully closed two sales and gained over $9 million in sales revenue with the Commercial Services’ help. Not only is Cardinal Resources, LLC taking advantage of the export opportunities in Africa, but it is strengthening our economy at home by sourcing 90 percent of the components for its systems from U.S. manufacturers. A project in Bayelsa, Nigeria, includes potable water storage tanks manufactured in Stoystown, Pennsylvania. Now that is good business! To learn more about information technology sector opportunities in Africa, register for the June 20th 11:00 a.m. EST Sub-Saharan Africa Region & Trends: ICT Sector Webinar. Is your business looking to expand their products overseas? Have you thought about the opportunities in Africa? Visit export.gov/Africa and sign up for email updates to get the latest on opportunities to do business in Africa, the DBIA campaign, and much more!